This Tel Aviv campaign by Veecee protests rent spikes by adding cardboard prostitutes to a neighborhood in hopes that landlords will stop addressing humble one-bedroom flats as lofts with vaulted ceilings. Trendhunter has additional imagery and video. The idea is neat but we're not sure how well it stands up considering bewildered passers-by in the 'hood didn't seem to have a clue why cardboard hookers were appearing at every turn. Perhaps they can take the campaign further and populate badly-lit areas with cardboard drug dealers, car thieves and crack addicts. And while they're at it, strew a bit of sludgy litter here and there. Park a few cardboard Pintos haphazardly in corporate lots. There are so many directions this idea can take. Do we have to stop at hookers? Just a smidge more cardboard deviance would get the message across loud and clear. This is one of the more pleasantly inventive and eye catching outdoor campaigns we've seen in a while. It makes its point quite clearly. 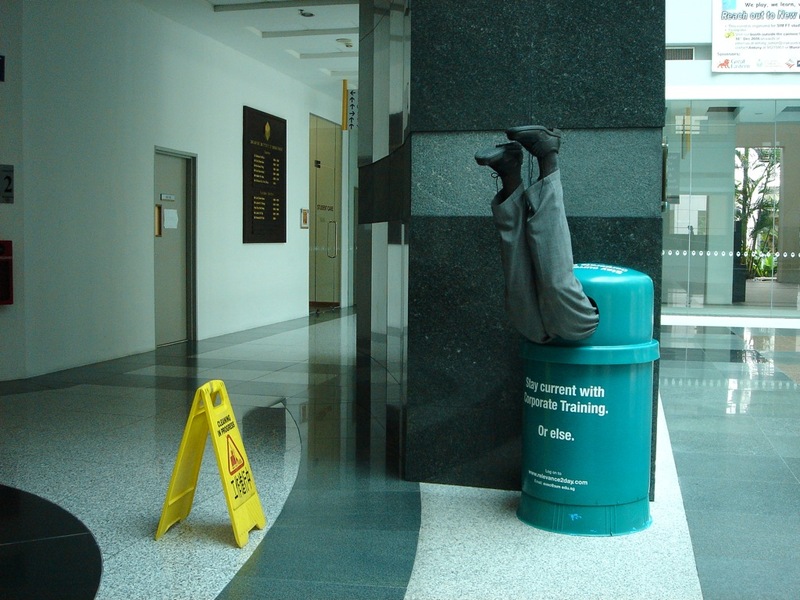 Unless you invest in yourself - in this case, corporate training - you're just a piece of useless, outdated trash good only for the trash bin. See another version here. 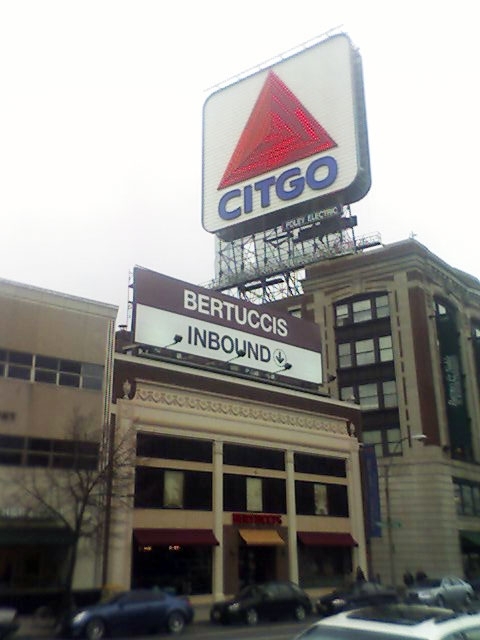 Adrants reader Joshua snapped this shot of a Bertuccci's billboard above one of its restaurants in Boston that mirrors the look of the city's transit signs. While we wonder whether or not the MBTA (Massachusetts Bay Transportation Authority) will have anything to say about this, we think it's an extremely creative approach. Bostonians have seen this style of sign for decades and it's ingrained in the psyche. Of course, we hope that means they'll notice it rather than ignore it since , unfortunately, once you've made the commute once, you don't need the signs any more. 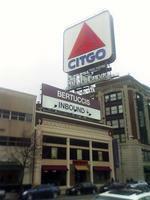 For those that don't know, there is no actual Citgo gas station under that sign. Eons ago, it became a landmark and has lasted long after the gas station left. - The networks never saw a meme they didn't want to jump on so it is without surprise they're all slapping ads for their shows up on celeb site PerezHilton. - Dammit, online customers are good for the music business! - This Fall, New York City taxi cabs will begin showing NBC programming. Come on! We don't want to be distracted from the city's eye candy now do we? - Anyone with the name Hamish McLennan is bound to attract attention and the Hamish McLennan that is the CEO of Y$R did just that with the terse firing of the agency's vp world creative director Michael Patti who was said to be under delivering. - Conde Nast is going after brides-to-be on MySpace with a page offering Brides.com video and photo content. 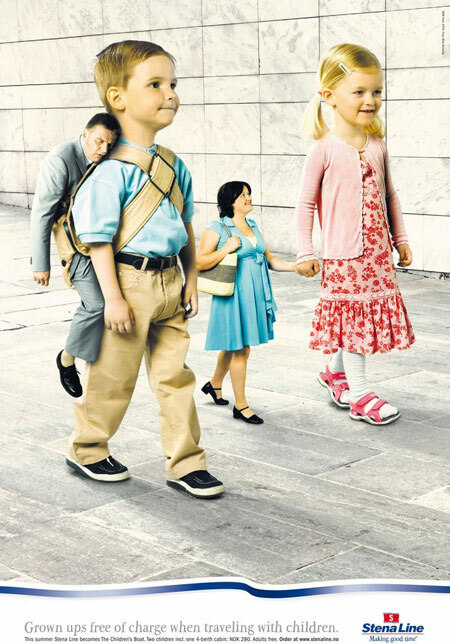 This somewhat creepy campaign is by Stena Lines, a major international ferry line. Apparently parents travel free if they bring at least two children. 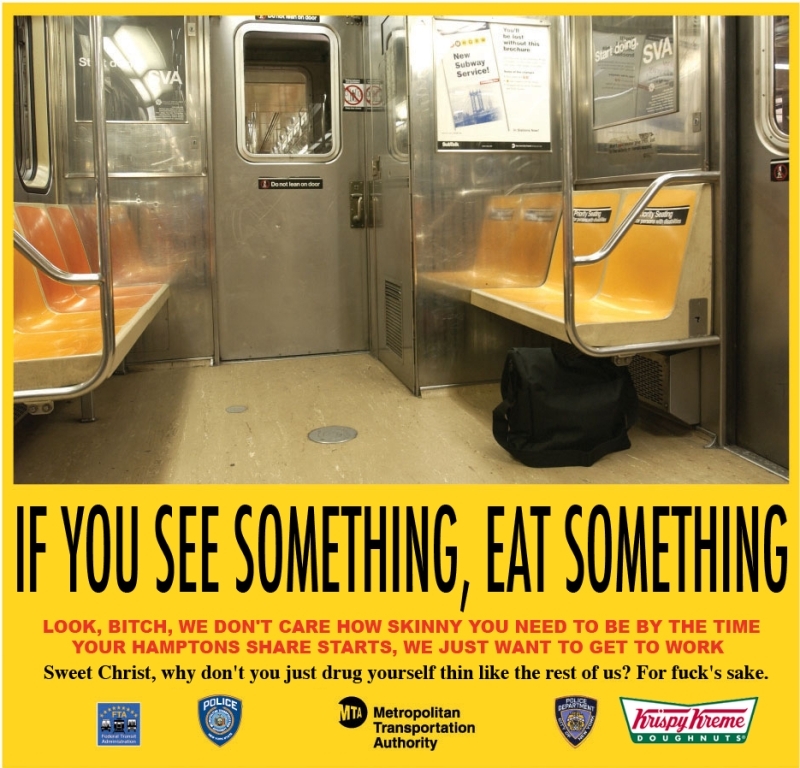 These ads do a good job of illustrating that notion. There's just something unfailingly Mini-Me about them that rings funny. Check out another version here. 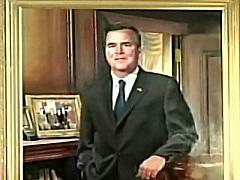 The alleged first e-governor, Jeb Bush, had his beloved Blackberry included in a portrait that'll go down in Florida governor history. If you're curious about the whole e-gov moniker it's because he often responds to his thousands of e-mails, which is pretty rare for our high-profile political chums. We don't think anybody should be called an e-anything until they've started a blog of some sort but we're sure Jebbie probably has some officially sanctioned one somewhere. Thanks Boing Boing for tipping us off on the Blackberry thing. - A case is made for the implementation of browser level ad filtering. 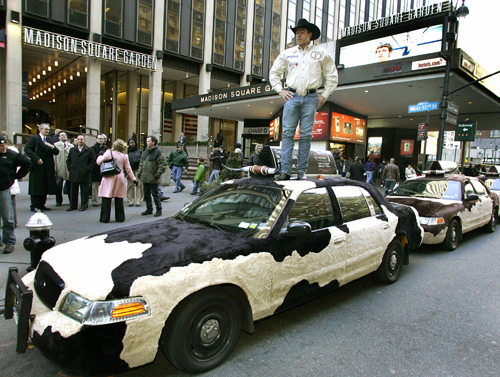 - New York City cabs get decked out like bulls to promote televised bull riding on cable channel Versus. - Sprint is on the hunt for a new creative agency for its $1.6 billion creative account. - Advertising Age's Jonah Bllom likes the new Wall Street Journal. - Qwest won't jack you up, mobsters recycle, Mini beats SUV in bullfight and more new commercial in Advertising Age's TV Spot of the Week. - Merrill Lynch says U.S. ad spending will increase 2.9 percent in 2007. Traditional slows but isn't dead. - In response to FOX's cancellation of The O.C., tweens and teens mourn throughout the nation. - England has now banned the advertising of cheese during children's programming. - The Webber Dance School is has placed footstep patterns on treadmills in health club so people can try to learn the steps while working out on the treadmill. Nifty, indeed. Asking for consumer opinions and airing them as ads is super trendy, and Monster hops on the clue train with Monster Works for Me, a campaign running on just about all iterations of traditional media to ask us why we do what we do. Created by Brand|Content out of Boston, it "recognizes the multiple reasons why people work and the passion that drives them," says agency CEO Doug Gladstone. "In short, no matter what you do, or what you'd like to do, Monster has the tools and resources that can help you find the right match, so you can be successful at whatever you pursue." While we can't claim it pulls much creative weight it certainly moves the long-dormant Monster in the right direction as people are more interested in what they have to say than what companies have to say anyway. And it definitely helps to play mirror. So cheers to Monster.